Flat and rectangular cigar box tops were ideal for display of attractive trademark images. Of all types of label images, portraits of beautiful women were the most popular choice to adorn cigar boxes. 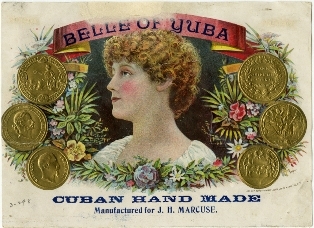 Idealized depictions of women, romantic scenes, floral decoration, and gold accents all flourished on cigar box labels. 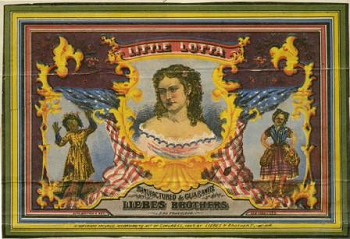 Many cigar box labels featured portraits of well-known persons. These were the celebrities of their day, and it would have been advantageous for a cigar company to be associated with them. While some labels honored personages that we still venerate, others were ephemeral celebrating, for example, theatrical performances or endorsing political campaigns that might soon be forgotten. In the past, children were often pictured smoking cigars. Such images, although shocking by today’s standards, were thought to be humorous and reflected the reality that many 19th century children did smoke. Street urchins, in particular, were pictured smoking cigars, adding to their mischievous appeal. 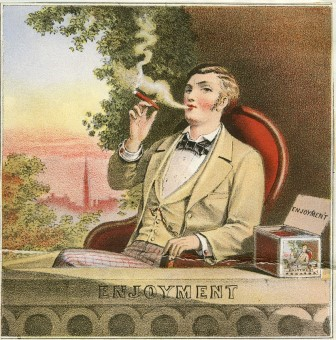 Some cigar box labels had images of young newspaper boys smoking cigars, while others depicted older male smokers. These comical images may have been meant to "poke fun" at smokers.